Molasses Cookies. 2 cups molasses 1 cup butter or lard 1 egg 1 tablespoon soda mix soft with flour & roll out. Some use sorghum or syrup. Cookies. 1 cup butter 2 cups sugar 1 cup milk 1 teaspoon soda 1 teaspoon ginger. flour to roll out. Cookies. 5 large teacups flour 1 teacup fresh butter 2 teacups powdered white sugar & handful carraway seeds, wet it with 1 egg well beaten & a little rosewater - add last a small teaspoon soda dissolved in a very little vinegar or sour milk - stir the whole well. Bake 15 minutes. 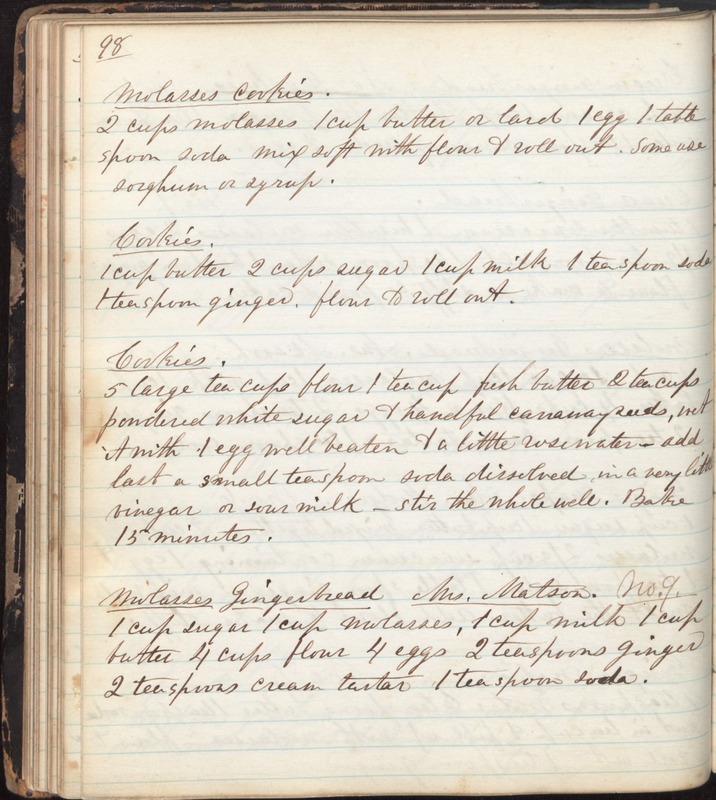 Molasses Gingerbread Mrs. Matson. No. 9. 1 cup sugar 1 cup molasses, 1 cup milk 1 cup butter 4 cups flour 4 eggs 2 teaspoons ginger 2 teaspoons cream tartar 1 teaspoon soda.